Metal fabrication is a very complex process consisting of a number of steps to design a complete metal structure. At the end, just a final touch has to be given so that the end product is according to the specifications given by the company. Creating metal structures through fabrication not only requires expertise but the desired skills to shape the metal and employ the right techniques to get a good result. There are a number of processes involved in getting the final product like cutting, welding, bending, assembling which are combined together to obtain the desired result. Through this metal fabrication process, industries can design their products with stainless steel, aluminum and other rough metals. When the company designs their products, they need to sketch the layout of the products, and then they need to consult with the metal fabrication company to do the product with the same designs. What Are the Different Processes of Metal Fabrication? # Cutting – Before any structure is designed, cutting the metal with precision is the first and foremost task. Though there are a number of cutting tools available to help the professionals but still being familiar with the tools also requires expertise. That is why it is necessary that the metal is cut in the right manner. Special cutters are also available for metal cutting in the right shape and form. One of the highly used tools includes the laser cutters which are equipped with the finest technology and cut the metal precisely without any problem. Sawing and chiseling is also a part of the cutting process which can be done either manually or with the help of any machine. # Joining or assembling – Once the metal is cut, the next step is to join them. There are several processes available to join the metal and welding is one of the most common. 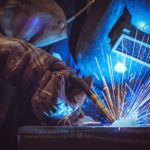 Welding involves the use of heat and a filler to join the metal pieces in the right way This can be done by using adhesives that ensure a powerful metal bonding or you can even use a metal rivet for it. Threaded fasteners are also a great choice offering a smooth connection of the sheet metal, which will be durable and easy too. It depends on the product designs and the nature of work that is required by the main company, that what type of assembling they need. Based on this requirement, the fabrication work can be done. # Bending – According to the name, the metal is bent with the help of different tools to provide the desired shape. With the advent of modern tools, it has become simple to bend the metal in any way thus leading to a well-shaped metal as per the specifications of the project. # Final touches – Once the above three steps are completed; it is now the time to give a final touch to the structure. This may include painting, coating etc. so that the metal can be used for a longer time and it attractive also. Sandblasting is another way of adding a final touch to enhance the overall appearance of the metal structure and give a bright finish to it. Products that are designed through metal fabrication find extensive use in the automobile industry as well as in the field of construction. There are many business owners who find the use of sheet metal, which is also prepared through metal fabrication. Most of the fabrication shops utilize a number of machines as well as tools to suit the needs of their client but sometimes it is necessary to devise a new tool that fits into the customer’s need.